While relatively new to many, the Agile Business Consortium’s Agile Project Framework is actually the most established framework for agile project management in use today. For over 20 years, the framework has provided a practical and scalable Agile approach that balances the principles and benefits of agile development with structure and discipline of good project management. One of the originators and key contributors of the framework, Arie Van Bennekum, was one of the founding members of the Agile Alliance and contributors to the Manifesto for Agile Software Development. Continuously enhanced and refreshed to reflect current practices and business requirements, the Agile Project Framework guides Project Managers, Business Analysts and Agile practitioners with a clear role and set of agile practices to achieve successful outcomes on IT and non-IT projects and change initiatives. The Agile Project Framework also provides the methodology and base content for the AgilePM®, AgileBA®, and AgilePgM® training and certifications provided by APMG International. The Agile Business Consortium states that “best business value emerges when projects are aligned to clear business goals, deliver frequently and involve the collaboration of motivated and empowered people.” This philosophy permeates through the principles and practices of the framework and the role of the AgilePM. 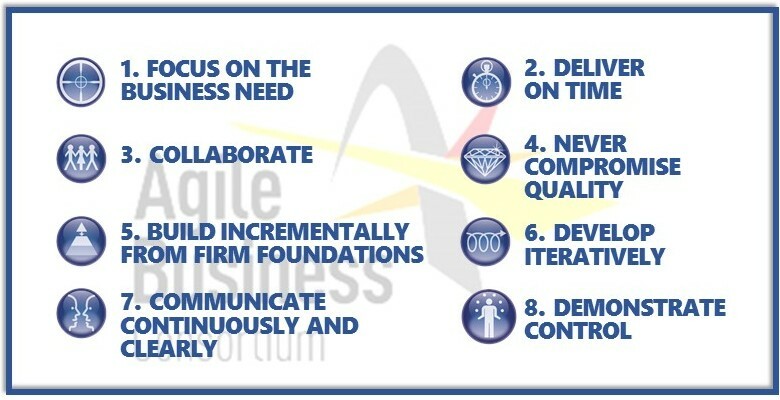 The figure below shows the eight principles of Agile Project Management. To provide a flavor and introduction to the framework, let me touch on a couple of these. In Agile, our highest priority is to satisfy the customer through early and continuous delivery of valuable software. In order to satisfy their needs, we obviously need to understand them. To be agile though, projects should do just enough requirements and design as is necessary up front—welcoming changes throughout the timeboxed iterations and incremental delivery of the working solution. In the Agile Project Framework, the project needs to begin with a fundamental and foundational understanding of the vision and rationale at the early and initial phase of the project. This is necessary to understand and clarify the structure of the overall solution necessary for successful development and delivery. The analysis and design activity undertaken in this early stage (typically less than two weeks even on large projects) should cover the full breadth and goals of the project and should specifically and deliberately avoid going into detail (the depth). Substituting traditional ‘Big Design Up Front’ with ‘Just Enough’ up front promotes agility in developing the required solution while avoiding the risk of ‘No Requirements/Design Up Front’ – that makes many larger and more strongly governed organizations nervous. As with most agile approaches, the fundamental assumption of the Agile Project Framework is the acceptance of the realty that nothing is ever built perfectly the first time and that it is unreasonable to expect that all the requirements for a future solution can be predicted and defined in exact detail up front. The approach to managing a project in the Agile Project Framework recognizes this and uses practices like MoSCoW and timeboxing to guarantee delivery of a viable solution (a MVP) with a minimum subset of requirements. Another key element of the framework is an iterative approach that encourages detail to emerge over time. For any activity, it needs to be completed in only enough detail to allow the project to move to the next step (and any shortfall in detailed understanding is dealt with in a subsequent iteration.) Since there is a strong likelihood that the business requirements will change over time (and that such change is even more likely to happen at the detail level) the effort spent on detailed up-front work is very often wasted. 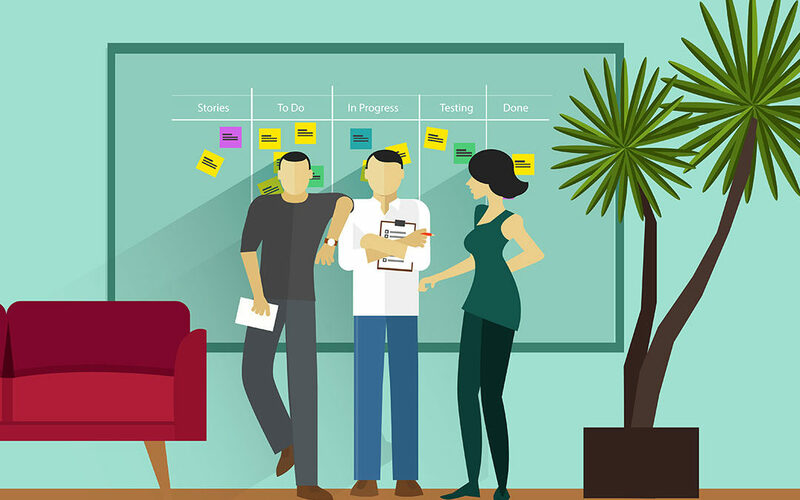 The attraction for many proponents and users of the Agile Project Framework is its ability to augment other agile approaches such as SCRUM and SAFe by recognizing the construct of a ‘project’ and the essential need of understanding and agreeing to the basic scope and fundamental characteristics of the proposed solution at an early stage before development starts. This makes the approach far more compatible with larger enterprises or organizations with complex architecture and governance standards where agreement to foundational aspects of a project early in the life-cycle is absolutely essential. The Agile Project Framework also describes a broader set of roles than most agile approaches making it a better fit with most corporate environments without compromising agility. In particular, it gives critical importance and responsibilities to both the Project Manager and Business Analyst. At IAG, we like this framework particularly because of this and because the philosophy and principles align so perfectly with those we, at IAG, believe are essential to success project management, product development and organizational improvement. For more detail on the framework and support in Agile Project Management I encourage you to take a look at the complimentary resources and webinars available at https://www.iag.biz/resources/agile-insights. And for coaching, assistance, and course offerings, visit our website https://www.iag.biz/capabilities/agile or give us a call at 800-209-3616. AgilePM®, AgilePgM®, and AgileBA® are Registered Trade Marks of the Agile Business Consortium Limited in the United Kingdom and other countries.